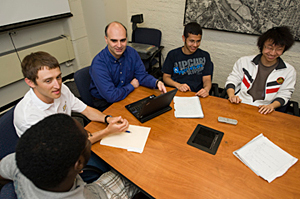 Dimitrios Peroulis, associate professor of electrical and computer engineering, was one of five exceptional teachers honored this spring with a 2010 Outstanding Undergraduate Teaching Award in memory of Charles B. Murphy. Peroulis says receiving the Murphy Award has significantly enhanced his motivation and commitment to keep providing students with the best Purdue experience possible. And motivation is exactly what Peroulis says his students need in order to succeed. Peroulis says every student has a unique personality, learning style and needs. As a result, he finds it challenging to define a lesson that everybody needs to learn. He has practiced a number of new instructional techniques that fit a large variety of individual learning styles. These include interactive in class laboratories, voluntary weekly discussion sessions outside of normal class time, extended weekly office hours and voluntary sub-group lunches. These techniques have helped Peroulis win every teaching award available in his department, the highest teaching award of the College of Engineering and the HKN C. Holmes MacDonald Outstanding Teaching Award. Peroulis believes in a learning model that involves a balance of theory and practice. “Understanding complex concepts often requires a chance to practice and apply problem-solving skills from simple cases to real-world problems,” he says. Peroulis adds that this model, when combined with having positive expectations from students, allows for an environment where calculated risk is acceptable and expected.